I haven’t known Harry Mayerovitch, class of '33, for as long as many here, but then, I’ve been at McGill for only 35 years. And I don’t remember exactly when our paths first crossed - he was there when I entered the School of Architecture in 1969, and, it seemed, would always be there. "In the late 60s and early 70s the School, like the university, was in a state of turmoil. Student activists were demanding a meaningful role in the decisions that affected everything from curriculum design to evaluating their professor’s teaching performance. The administration initially resisted and the students went on strike. Eventually a ‘school committee’, made up of staff members and students, was formed and a series of open meetings took place to attempt to resolve the differences." "Harry, who at the time had an active and successful practice, only months before had decided to spend some time in the School as a self-prescribed continuing education exercise. In no time at all, he earned the everlasting gratitude of the staff by deftly inserting himself into the midst of verbal mayhem of the committee sessions. He seemed to be right at home in dealing with the cut and thrust of debate. With a skill that a fencer like his old teacher Percy Nobbs would have admired, he deflected attacks and scored points at will. His grasp of the profession, the architectural education system and life in general was more than the students could counter." Harry has been a member of the teaching staff of the School since 1965 – in fact, his current appointment will not expire until August 31, 2005 – we’re not sure how we’re going to break the news to the administration that he’s actually gone… Many of you will be interested, but not necessarily surprised, to hear that his mailbox, one of 40 or so in the School’s main reception area, is significantly busier than most of the others. His first teaching assignment was with the late Norbert Schoenauer, and in the intervening 40 years he has taught with most, if not all, of my colleagues. "I enclose an appointment form for one of our three proposed Visiting Professors of Architecture for 1965/66. Mr. Mayerovitch, you will see, is a McGill graduate of many years ago. He has practiced in Montreal and has been very active in professional affairs here. He is an old friend and supporter of the School. I admire him greatly and feel confident that his visits will be stimulating and fruitful." "Stimulating and fruitful" – an accurate prediction but an understatement. Harry was a wonderful teacher, and a frequent and popular guest critic in design studios and other courses at every level of the program; he never turned down a request for assistance, or an invitation to talk to students. And when he talked to students, or to any of us for that matter, he was always perceptive, passionate, provocative and playful – I hope he appreciates the alliteration – but he was never predictable. I’ll cite just two examples of his famous unpredictability. A few years ago, I invited Harry to a first year design review. This is an event that takes place at the end of a design project; students pin up their work and present their projects to a kind of jury made up of their teachers and invited guests, like Harry. He was, as usual, incisive and inspiring – I think he was at his best when he was surrounded by the younger students - but what most surprised and delighted the class was the fact that he had arrived with 45 copies of his new book, How Architecture Speaks, and presented each and every one of them with a copy. Another example. Recently, he dropped by the School and told us that he was just coming out of one his "Learning in Retirement" classes. Jean-Louis Lalonde reminded me a few minutes ago that he was the one who actually introduced Harry to this program. When Harry turned up in the office, he was so evidently energized from the session that I asked him if he was teaching it or taking it – he was of course taking it… at 93, not merely keeping busy but planning ahead. All who knew him appreciated his highly intelligent but mischievous delight in the unexpected. He was frequently, even enthusiastically distracted, eloquent and engaging on an impossibly broad range of topics – from art and the city to recent discoveries in computer stores and garage sales. Some of those discoveries – from the garage sales, not the computer stores – decorate the shelves of mine and my colleagues’ offices. As Harry might have said, “It’s better to accumulate than never…” (Has anyone heard the reports of an alarming dip in garage sale activity in Westmount in the last four weeks?) His own Curriculum Vitae identifies, in addition to architecture, urban design, limericks and lower forms of poetry, a list of interests that include painting, sculpture, lithography, etching, lino-cutting, caricature and cartooning, posters, copper enameling, puppetry, photography and glass engraving, to name just a few. He was a member of the Order of Architects of Quebec, the Corporation of Urbanists of Quebec, the Canadian Institute of Planners, the Royal Canadian Academy of Arts, the Canadian Society of Graphic Arts, and he was a Fellow of the Royal Architectural Institute of Canada. The list of other organizations, committees and commissions that benefited from his knowledge and imagination is staggering in its length and breadth. His many legacies to the School include his course "Philosophy of Structures," which is now taught by Professor Pieter Sijpkes; three handsome portraits in oil of his friends and colleagues Percy Nobbs, John Bland and Derek Drummond; his last self-portrait, and probably his first digital portrait, which he sketched on the screen of my laptop a few months ago, and then used on the cover of his last book Way to Go. Not the least of his recent contributions to the School was his participation in last fall’s symposium on the legacy of John Bland – none of us who were there will ever forget the eloquence and power of his closing address. In the spring of 2000, we added some special trees to John Schreiber’s Centennial Garden on the main campus lawn, just in front of the School. Two trees were planted to mark the birthdays of two distinguished grads and friends of the school. One, a weeping willow, honours Harry’s friend Roy Wilson, class of '24, who celebrated his 100th birthday that spring, and the other was for Harry, who had just turned 90. Each was invited to select the type of tree that would commemorate his name, and when Harry told us that he wanted a magnolia, I consulted my Manual of Trees and Shrubs. 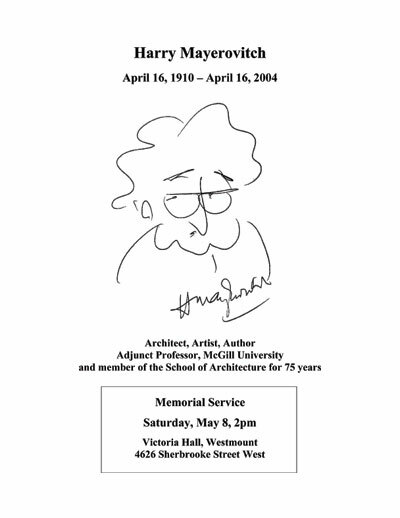 On behalf of the staff and students in the community of the School of Architecture, I would like to express our deepest condolences to Harry’s family and friends; we loved him, and we were looking forward very much to seeing how he would turn out in his old age - he would have been a very interesting old man. We will miss him dearly.